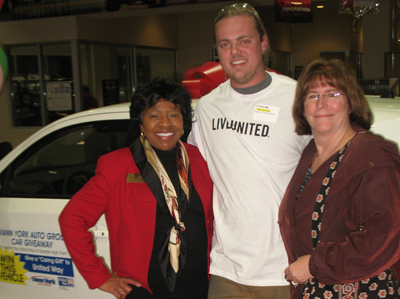 Victor Sinclair flanked by Reatha Ward from United Way (l) and Mickey’s Gail Wells. Victor Sinclair, like every other Mickey employee, donated a percentage of his paycheck to the 2014 United Way campaign of Greater High Point (NC). And for the 13th consecutive year, Vann York Toyota, a High Point car dealership, teamed with the nonprofit group for an annual car giveaway to honor those who gave. Out of 4,500 area donors who were entered into the drawing, 10 finalists were each invited to pull a key out of a bag. Guess whose key started the brand new Scion? That’s right. Victor, a Mickey welder for the past couple of years, had the key that turned on the car as family, friends and co-workers stood and cheered. But the big moment didn’t come without suspense. Victor was close to the end of the line nervously clutching his key when his turn came to give it a try. Nothing happened when he put the key in the car door lock. He began to frown when someone began clapping and cheering from the back of the room. “Try it again,” yelled Greg York, President of Vann York Auto Group. “Turn it all the way.” The alarm sounded and Victor was consumed by equal parts of shock and excitement. Read the full story in the HIGH POINT ENTERPRISE.